Enjoy this wonderful collection of fruit ade recipes from Grandma's day. The tremendous popularity of lemonade remains undisputed, but old fashioned citrus drinks flavored with orange, lime, pineapple, raspberry, cherry, or grape using fresh juices and fountain syrups were also famous as thirst quenchers. Authentic fruit ade recipes call for the juice of citrus fruits like lemon, orange, grape, or lime, with sufficient powdered sugar (or simple syrup) to sweeten, to which is added plain, mineral, or carbonated water. In most fruit ades, slices of fruit, cherries, strawberries, and so on are added ingredients for garnishing. A special "golden ade" is made by adding the yolk of an egg before shaking. Ades are traditionally served very cold with straws in a 12-ounce lemonade glass. A long-handled spoon should be offered when serving beverages containing fruit pieces. Pharmacy soda fountain operators had a very effective way of promoting these hot weather drinks. They would select an appealing fruit ade recipe, then mix up a large punch bowl of the mixture containing ice and set it prominently on the marble counter. A quality bowl of cut glass made the colorful citrus beverage especially attractive. Also, a side arrangement of seasonal fresh fruits and berries along with slices of orange and pineapple added to the display. This is also an attractive way to serve your ade drinks at a party or a backyard get-together. You'll find these nonalcoholic beverage recipes so easy to make, and the results are so delicious that you simply must try them! Ades make great-tasting beverages that really refresh. You'll enjoy them anytime, and they make a great and wholesome alternative to commercial soft drink beverages. In the old recipes, note the suggested prices for the soda fountain operator to charge. You pay more than ten times that amount for a similar drink today! Juice of 1/2 orange, juice of 1/2 lemon, 2 tablespoonfuls pineapple juice, 2 tablespoonfuls powdered sugar, 1/2 glass crushed ice. Fill glass with water; shake well and serve with straws. Price—12 ounces, 15 cents. Juice of 1 orange, 1 tablespoonful powdered sugar, 3 dashes lemon juice, 1/2 glass fine ice. Fill glass with plain water and shake well. Dress with fruits. Price—10 ounces, 10 cents. Juice of 1 orange, juice of 1/2 a lime, 1/2 ounce orange syrup, 1 tablespoonful powdered sugar. Mix; shake all well with plain water and quite a bit of shaved ice. Garnish with a creme de menthe cherry (a maraschino cherry will also do), and a thin slice of orange. Price—12 ounces, 15 cents. Juice of 1 orange, 1/2 ounce raspberry juice, 1 dram (3/4 teaspoon) lemon juice, 1 tablespoonful sugar, 1/2 glassful shaved ice. About half fill the glass with carbonated water, stir, strain into a mineral water glass and fill with carbonated water. A fancy orange soda recipe. Price—10 ounces, 10 cents. 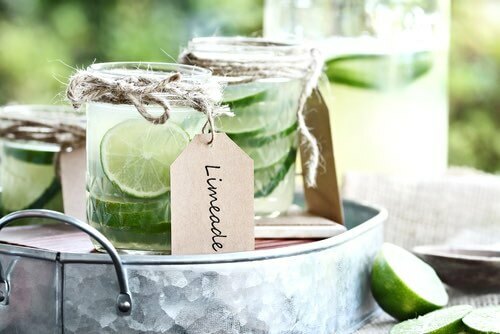 Squeeze the juice of 1 lime into a 12-ounce glass, put in one-half the rind, add 1 ounce of lemon syrup and 2 tablespoonfuls of powdered sugar, fill glass two-thirds full of crushed ice and pour on carbonated water until the glass is nearly full. Mix by pouring from glass to strainer several times; finally strain into the glass and serve with straws. Price—12 ounces, 10 cents. 1/2 ounce of lime juice (or juice of 1/2 lime), 1/2 ounce strawberry juice, 2 teaspoonfuls powdered sugar, 2 dashes wintergreen essence (optional). Shake with cracked ice, strain and add carbonated water. Price—10 ounces, 5 cents. Juice of 1 orange, 1/2 ounce grape juice, 1/2 ounce raspberry syrup, 1 teaspoonful lemon juice. Mix; add a tablespoonful of sugar and 1/2 glassful shaved ice. Half fill the glass with carbonated water, stir, strain into a mineral water glass, and fill with carbonated water. 2 ounces grape juice, 1 ounce strawberry syrup, 6 rose leaves, 6 mint leaves, crushed well against side of glass with ice, 1/2 glassful cracked ice. Stir thoroughly, then add carbonated water and serve in tall lemonade glass. Decorate with creme de menthe (or maraschino) cherries and a slice of lemon. Price—12 ounces, 15 cents. This strawberry-ade recipe makes a truly delicious drink. Juice of 1 lemon, 1 ounce strawberry juice, 1 teaspoonful powdered sugar. Add shaved ice, sake, strain, and fill solid with plain soda water. Stir and serve with straws. The formula may be improved by adding more sugar to taste. Charge 10 cents for 12 ounces. In a 12-ounce lemonade glass squeeze the juice of half a lemon and half an orange, add a dash of cherry juice and 1-1/2 ounces of simple syrup. Fill the glass about two-thirds full of cracked or shaved ice and fill with plain water. Turn all over in a shaker and mix well. Put in two straws and decorate with a red cherry and a couple of sprigs of watercress. Juice of half an orange, juice of half a lemon, 1 ounce pure grape juice, 2 teaspoonfuls powdered sugar. Cracked ice to half fill the glass, carbonated water to finish; shake, serve in 12-ounce lemonade glass. Garnish with a slice of orange and a cherry. Charge 15 cents. Put into a large soda tumbler 1 tablespoonful of raspberry syrup, 1 tablespoonful of lemon squash, and a lump of ice; nearly fill the glass with carbonated water and ornament with a thin slice of lemon and a few red and white raspberries. Drink though straws. 1/2 ounce grape syrup, 1/2 ounce lemon syrup, 7 ounces carbonated water; stir gently with a spoon. For this fruit ade recipe, use one ounce lemon syrup, 1 ounce grape juice in mineral glass, fill up with carbonated water, stir well and serve.